Learn about Nelson Mandela, South Africa's first black President, and enjoy our colouring page and printables for kids. Nelson Mandela real name was Rohlihlahla Mandela. He was born in July 1918 and wasn't called Nelson until he started primary school and his teacher gave him Nelson as a Christian name. Now the whole world knows Nelson Mandela as the first black South African to be elected President of South Africa (1994-1999) and a brave man who endured 27 years in prison with dignity. Nelson's parents couldn't read or write, and he was the first in his family to attend school at age seven. His father died when he was about nine, and he was sent to live with Jongintaba, the king of the Thembu, his people, and treated as their son. Christianity became a significant part of his life, as did the history of native African culture. Nelson went to University at Fort Hare and later the University of Witwatersrand. He made many friends of all colours and nationalities, but was the subject of racism. Nelson became increasingly politically active, joining the African National Congress (the ANC) in 1944 and helping to form the ANC Youth League. At the time in South Africa there were many things that the blacks were not allowed to do, including vote and own property, and the ANC wanted to change that. This policy was called "apartheid" and the African National Congress was anti-apartheid. Although the cause was good, unfortunately, over the next 15 years the struggle became increasingly militant and violent, and Nelson Mandela, who became more powerful within the ANC, agreed at the time that the violence was necessary. In 1962 Nelson was captured and imprisoned for five years for encouraging the country to strike; the following year he was charged with trying to overthrow the government, and sentenced to life imprisonment. Nelson spent his many hard years in prison studying when he could and keeping in touch with the ever-increasing disharmony in South Africa, which threatened to break out into civil war. 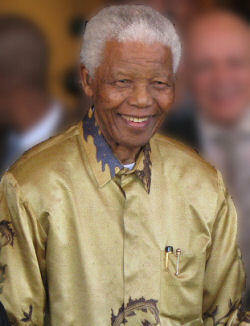 All over the world people began to campaign for his release and the "Free Nelson Mandela" campaign was started. In 1990 South Africa's President de Klerk met Nelson and arranged for him to be released - a very moving event which was broadcast on televisions all over the world. After his release, Nelson and de Klerk worked together to end violence in the country and restore order, and Nelson was elected President in 1994, serving for one term. After his presidency, Nelson Mandela focused on charity, setting up the Nelson Mandela Children's Fund and Nelson Mandela Foundation to fight poverty and HIV/AIDS. He won the Nobel Peace Prize (in 1993) and the US Presidential Medal of Freedom. Learn to draw Nelson Mandela with our step by step tutorial! Here's a simple colouring page of Nelson Mandela to print for the kids. Here's a fun cartoon-style poster of a young Nelson Mandela in one of his trademark shirts, designed to appeal to younger children. Write about Nelson Mandela using this simple writing page, available in colour or black and white.